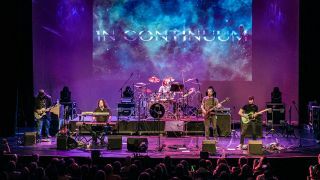 Dave Kerzner’s In Continuum have released a lyric video for their new single exclusively with Prog. The song is titled Crash Landing and features a guest appearance from guitarist Steve Hackett and Yes frontman Jon Davison, who shares vocal duties with Kerzner. It’ll appear on the band’s debut album Acceleration Theory, which is scheduled for release later this month. Kerzner, Hackett and Davison are joined on the track by bassist Matt Dorsey, drummer Marco Minnemann, guitarists Fernando Perdomo and Randy McStine, along with Kaitlin Wolfberg and Ruti Cello on strings. Kerzner says: “This song sets up the story of our sci-fi concept album called Acceleration Theory. As for Hackett’s contribution, Kerzner adds: “Steve and I really enjoy working together. This time we’re doing something more upbeat and trying out new things. Acceleration Theory is now available for pre-order via Bandcamp.